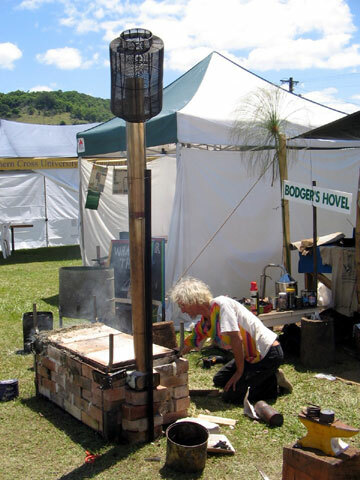 A group of volunteers at the Rainforest Information Centre in Lismore, NSW, Australia have formed a village-scale biochar work group that has won a grant to produce small farm and village-scale non-polluting biochar kilns. APE-UK, Artists for Planet Earth, selected the biochar kiln project from many hundreds of applications for a grant of £5,000. APE-UK grants are funded from sales of world music tracks donated by musicians. 540 Phoenix-1. A micro kiln for small heating, cooking and party warming. Excellent experimenter’s batching kiln for characterizing biochar feed stock and varying kiln parameters, for efficiency testing, batching, and loading and unloading access issues. Pyrolysis chamber approx 8 – 15 litres. 540 Phoenix-2. A medium size kiln with water heating for a bath, and an option for multi-chamber continuous firing. A precursor to a Naborigama style climbing kiln using 20 litre drums. About 20 – 60 litres. 540 Phoenix-3. A community and farm-size batch kiln, with woodgas outlets, extensive pyrometric analysis ports, Tuyere air inputs, venturi draught extraction and venturi chimney stack, under-kiln floor stoking and exhaust channels, bourrey-box pre-heaters and small charcoal-powered afterburner for start-up smoke destruction. The overall project is to run for eight months, and will produce public domain/creative commons working designs, and support material (including a wiki in 2009) on how to build a kiln. The constraints will be construction at the village-tech level of skills, in light steel, firebrick, and concrete. As a secondary aim the project will look at potential uses of the waste process heat. Primarily this will be for drying feed-stock. Some suggestions for community uses are for drying clothes in the wet season, hot water for laundry, hot-tub, and sauna. Time allowing, there is the possibility of extending the kiln design to be a “breeder kiln”, by co-firing green kiln bricks and kiln furniture. Using local clay, this would allow self-replication and repair indefinitely, and provide shards, or even terracotta night-soil vessels, for terra preta experiments. The kiln project involves a large community of supporters who are contributing second hand and donated materials and voluntary labor. The project has been given the enthusiastic support of one of the first intentional communities in the area as well as the use of land for a kiln site, farmland adjacent to the site, and farm machinery. The Wollongbar Department of Primary Industries Biochar research facility will advise the project. Senior research scientist Dr. Lukas Van Zwieten has offered the use of the Departments “pyrograms” for establishing and cataloging char signatures. The project is also working on using LETS (Local Exchange Trading System), payment in kind and direct barter, in addition to traditional currency, for the biochar. The intent is to look at how alternative currency systems can work with biochar sales, and potentially mimic some economies in developing countries. The project overseer is John Seed, founder of the Rainforest Information Centre. The research, design and production team coordinator is Geoff Moxham, BSc Industrial Arts, Technology, UNSW. Other participants currently include Dr. Paul Taylor (UNSW), Peter Gibson, Chris Phoenix, Greg Hall, Patrick Anderson and blacksmith Adam Jung. Click here for more information on the Rainforest Information Centre. IBI is saddened to announce that on August 27, 2009, Geoff Moxham suffered a fatal accident while working in the forest near his home in Australia. We will miss such a vibrant spirit in the biochar community.